Pestos with Panache by Lauren is a company that sells different kinds of flavored pestos. ﻿Here is some information about the company: Pestos With Panache by Lauren™ is the art of pesto at its finest: a total dedication and commitment to the pesto revolution. Our signature pesto is a Pumpkin Chilpotle blend with a smoky bite that has won the hearts of fine chefs everywhere. But that’s just the beginning. Pestos With Panache by Lauren™ offers a complete line of innovative flavors, each unique and special in its own right. I was sent the four kinds of pesto seen above. I've always been a huge pesto fan and was excited to try of of these unique kinds. I opened each one and took a little taste on bread. My favorite is the prosciutto & smoked almond followed by the fabulous fig and gorganzola. Also, I was not a fan of the pumpkin chipotle one. It may be good mixed into a pasta though. The next night, my sister came to visit and I made whole wheat pasta with the prosciutto & smoked almond pesto and we both loved it. The flavors were strong and fresh. I love that this pesto can be frozen because I can just pull it out whenever I need it for a quick meal. We also had some stir fried brussel sprouts with the pasta and those tasted great with a little pesto on them also. This pesto helped to make a fast and delicious dinner and I can't wait to create more fun recipes with the other flavors of pesto! **You can order the pestos online on the Pestos with Panache by Lauren site. The giveaway will be for three different flavors of pesto of your choice from Pestos with Panache by Lauren. The giveaway is open until Midnight on Tuesday July 12th. Winner will be chosen on Wednesday July 13th using Random.org. The winner will have 48 hours to respond or a new winner will be chosen. 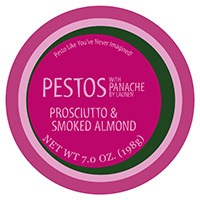 Visit the Pestos with Panache by Lauren website and let me know what kind of pesto that you want to try the most! Good luck everyone and thank you for taking the time to enter! Fabulous Fig and Gorgonzolla sounds amazing! I love figs and the combo sounds delicious. I would like to try the Succulent Strawberry !!! hoo ray for stawberries ! I would most like to try the Pumpkin Chipotle pesto! I like both on facebook, and receive your emails. I have never tried pesto before,so I would really love the chance to try some! The pumpkin chipotle sounds amazing! Who knew it could be such a great combo! I would like to try the succulant strawberry. I like you on FB as Anne Loyd. I entered the Western Chief Chooka Rain Boots giveaway. I entered the Almondinas giveaway. I entered the NuxUSA giveaway. I'd love to try the Succulent Strawberry Pesto! I follow you through GFC under Kayla @ TheEclecticElement! I entered your Julian Bakery Giveaway! I entered your Buy Green ChicoBag Giveaway! I entered your $111 Nux USA Giveaway! I entered your $50 of Bella Viva Dried Fruit giveaway! I entered your Almondina Cookies Giveaway! I entered your Western Chief Chooka Rain Boots giveaway! I'd like to try the Prosciutto and Smoked Almond Pesto added to a lasagna recipe. That served with a bottle of red wine. I'd like to try the Bangin’ Blueberry Pesto. i would most like to try fig and gorgonzola pesto! I'd like the try the Prosciutto & Smoked Almond Pesto flavor the most. Thanks! I'd love to know what Bangin blueberry pesto tastes like! I LOVE TO TRY THE BANGIN' BLUEBERRY - I LOVE THE NAME!! love the Succulent Strawberry ! I entered your $160 14k gold Erica Anenberg Ring Giveaway! I would love to try Decadent Dark Chocolate & Ancho Chile Pesto. Yum! I subcribed via google friend. I would love to try the Strawberry Pesto. It sounds delicious! I'd like to try the Pumpkin Chipotle pesto! ... though the Succulent Strawberry is a close second. Entered the $160 Erica Anenberg giveaway. Entered in the Helps Tea giveaway. I'd like to try the succulant strawberry. Bangin' Blueberry would be my pesto of choice! I entered the Almondina Cookies Giveaway. I entered the $160 14k gold Erica Anenberg Ring Giveaway. I want to try Pumpkin Chipotle because I like smoky spice! I checked out the different kind of Pestos and I'd most like to try the Prosciutto & Smoked Almond Pesto! Pumpkin Chilpotle Pesto sounds amazing! Lemme at it! I'm with you. The prosciutto & smoked almond sounds yummy.